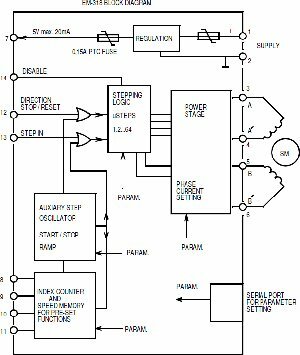 EM-318 is a bipolar-chopper type microstepping steppermotor controller. The bipolar operation principle suits most stepper motors and provides the best torque. The microstepping function also enables great performance at low rpm. The stepping and current regulation has been synchronized, giving a smooth and quiet operation. There are 7 different stepping options to choose from, ranging from full- to 1/64-step operation. This provides various possibilities for different speed applications. The controller has its own auxiliary oscillator, which can be used for pre-set speed driving. The pre-set speeds can be activated by using 4 digital function inputs. The oscillator features an acceleration ramp function, which allows frequencies to be altered flexibly. The motor will also start up reliably even to higher frequencies and it is possible to shift to the desired velocity with out pace drop. The auxiliary oscillator incorporates an indexing part, which offers the possibility of running presettable operational sequences. These secuences can be activated with the 4 digital inputs. The sequence is a movement with selected speed, direction and distance (as steps). All the inputs are activated with positive logic commands. So the commands and functions are activated by connecting the input to a positive voltage. Control can also be done with TTL-logic level commands. All of the controller settings are made digitally, using the separate setting device, EM-236 Interface Unit. With this device the settings are easily copied to an other or even to multiple controllers.